My friend, Emily Howard of Consider the Wildflowers, recently shared a FANTASTIC article on Darling Magazine. As a self-made entrepreneur, she's sharing her best lessons learned. I can't tell you how much I enjoyed her insight! This gal is a true creative with a solid business mind, and I admire her perseverance and desire to share with others. I recently discovered Arent & Pyke, a fantastic Australian design firm, and cannot get over their Pavilion House project. Lately, I am obsessed with 'cookies & cream' marble, and this is definitely my favorite execution of the finish. The bookmatched backsplash is an insanely gorgeous detail, and the hammered brass pendants polish the monochromatic kitchen finishes. JUST STUNNING. If you've spent more than 10 minutes with me, you've probably heard me ramble on about various pieces of furniture. I'm an unashamed furniture NERD. Out of them all, though, the Bertoia collection for Knoll is easily my favorite. About 2.5 years ago, I found two mint-condition Bertoia Diamond Lounge Chairs – complete with the original (and now discontinued!) Knoll upholstery. I purchased them from a retired dealer, and they had been protected in storage since the 50's. Yesterday, I was browsing through an Atlanta antique store when I suddenly looked up and stopped dead in my tracks. THERE THEY ARE! A full-set of 6 dining/side chairs in the exact same finish as my lounge versions! These chairs aren't in the same mint-condition, but I plan to continue using them outdoors anyways. I'll just quickly refinish them with a new coat of satin black Rustoleum, and we're good to go! Ah, my garment rack! This heavy-duty piece of beauty has carried me through 3 different California homes. In fact, it's one of the only things that have made it to all three apartments (I purge & re-decorate constantly)! In my new home, where wood chip flooring dominates the landscape of the bedroom, the reclaimed wood rack just wasn't doing it for me anymore. I have a little rule-of-thumb that I use when designing – no more than 2 wood types/species right next to eachother. If there are more than 2 in the same room, they should be spread out across the space and compliment one another in tone, texture, and color. 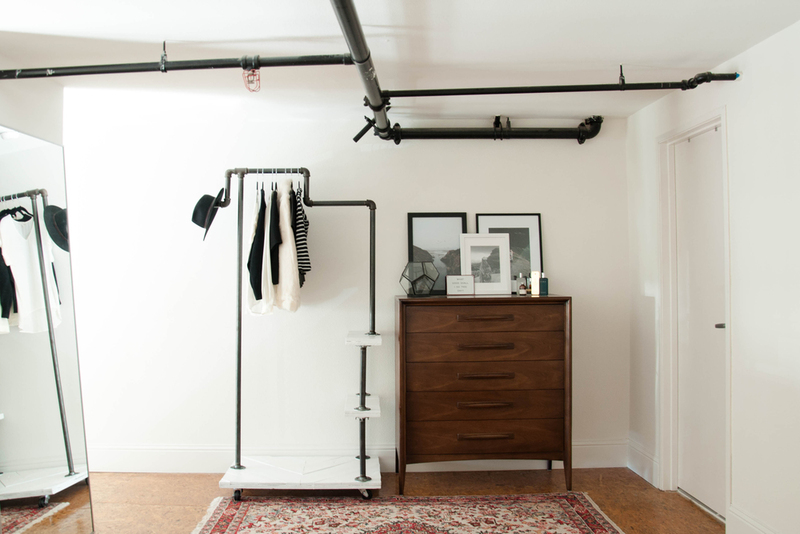 I just couldn't handle the little corner where the floor, the reclaimed garment rack, and the vintage mid-century modern came together. It's been driving me insane. Since moving in, I've spent quite some time thinking about how to deal with things. I've always dreamt of gorgeous white-washed floors with subtle wear and charm. But, since painting my floors wasn't an option in a rental, I began thinking of changing the furniture instead. Well, painting our vintage Broyhill bedroom suite definitely wasn't an option. That thought was immediately out. My next idea was to white-wash the pallet wood panels that compose the base and shelves of my garment rack! I might never live in that cute little all-white Scandinavian apartment, so this felt like a decent Option B. Off to the paint store! I stopped by Kelly Moore to pick up a small can of paint. Since the base of the garment rack holds shoes, I chose a durable satin finish in "Whitest White." It took two coats of paint to get the color where I wanted it. I am so happy with the way it turned out! I really love the reclaimed wood version of the past, but it was just time to give this piece of furniture a new life! If there's anything that you're just tired of, especially a piece of furniture, I'm here to tell you that there's always a way to make it feel brand new. I was seriously on the verge of listing the rack on Craigslist – I'm so happy that I gave it another shot! Oh, Happy Tuesday! This day is already on a roll. I woke up to an email announcing the impending release of a new My Morning Jacket album and thought the day couldn't get any better. Then I signed onto my blogroll and learned that Dusen Dusen has just announced an extensive collection of goods for the home! Oh my! I'm definitely an avid fan of their collaboration with West Elm (and the general idea of using Dusen products for interiors), even though the collection of 2 pillows was a major tease. Alas! They were just teasing us! Dusen's new line of home goods is expected to include sheets, blankets, rugs, towels, pillows, and a pouf. 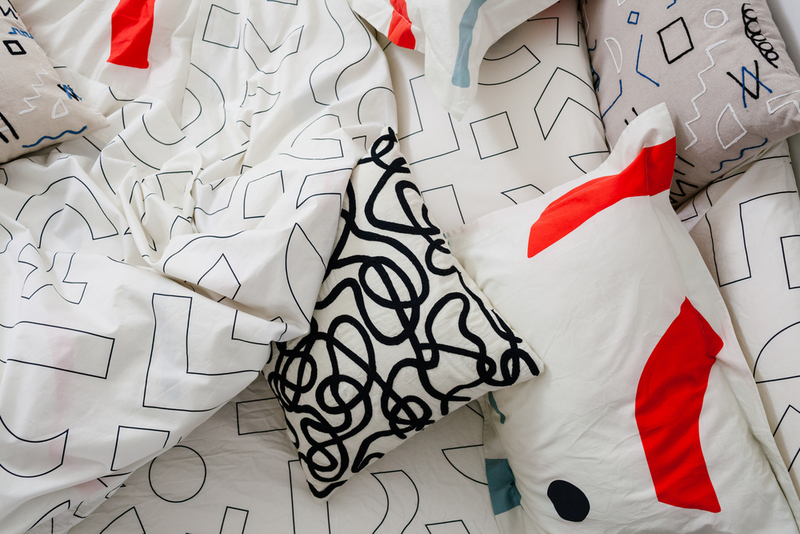 Now you can snuggle with squiggly high-contrast patterns until your heart is content! I know I plan to. I've gushed over this space before and, today, I'm gushing over it again. I love The Line's branded home space - The Apartment. It's moody, yet soft, and located in New York City's SoHo neighborhood. It really doesn't get any better than this. 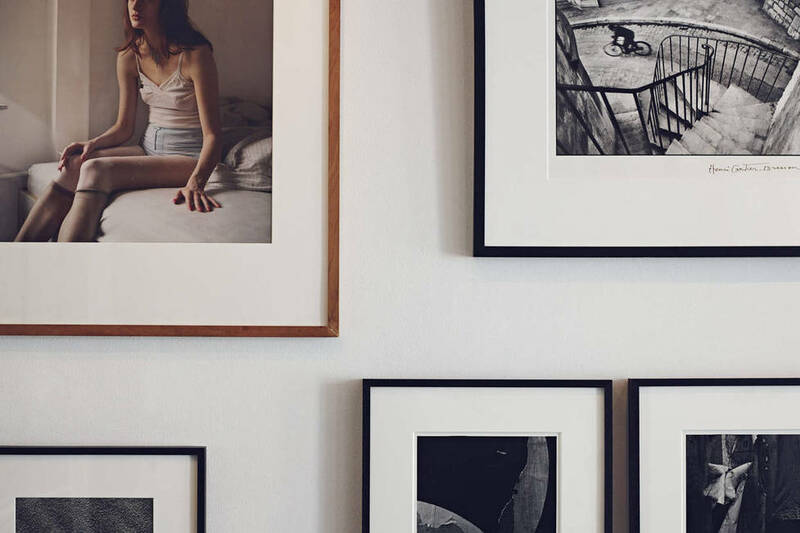 The Apartment is a curated shop (of sorts) that you can stay in. 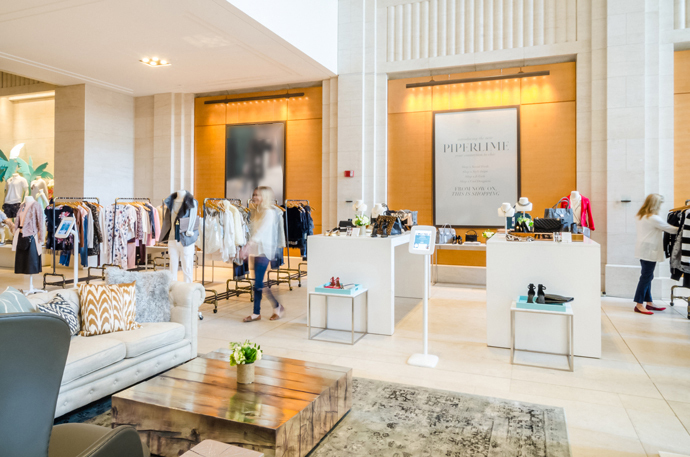 Everything in the space is hand-selected and for sale. I'd love to own the artwork over the bed - it's what first caught my eye. Good Morning! Today, I'm wildly excited to share one of my latest projects. A couple of weeks ago, I attended Everlane's Open Studio with a few friends. While having coffee afterwards, I met Ryan Hall, one of Piperlime's talented Graphic Designers. 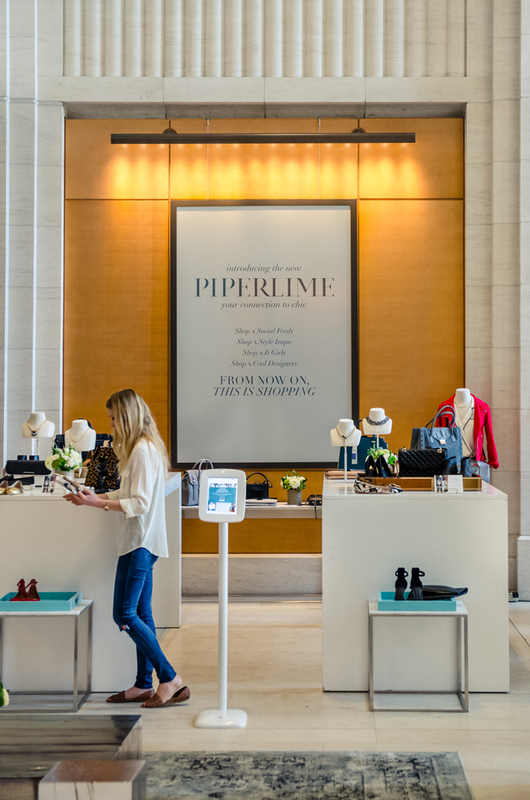 Through this relationship, I was given the opportunity to design Piperlime's San Francisco Popup. I worked with my design firm, Gensler, to get the job done quickly. The experience was an absolute dream. Despite the short time-frame and unusual programmatic challenges, things worked out beautifully in the end. This past weekend, my friends took me to the most incredible restaurant for brunch in LA. The Church Key's atmosphere is truly breathtaking - from the menu to the Interior Design. I ate a spectacular plate of Eggs Benedict with Truffle Hollandaise sauce and nibbled on hot potato cakes and biscuits and gravy. All the while, though, I could hardly focus on my plate because I couldn't stop examining the details of the space. There were countless moments of delight incorporated into the design. After brunch, I immediately searched for the Designer responsible for this gorgeous interior (this is how I discover all of my favorite designers). I learned that Carrie Livingston, a designer operating in Beverley Hills & London, was the the force that made it all happen. If you live in LA or ever have the opportunity, I certainly encourage you to stop by The Church Key. My friends tell me that their dinner rivals their brunch! I'll have to wait and find out. Until next time, LA. Don't forget to check out Carrie Livingston's other projects, and more photos of The Church Key here. Guys, I'm thrilled to tell you about Stone Textile Studio. I'm using their accent pillows on two current design projects, and I absolutely love the monochromatic aesthetic of their products. Black, white, and gray...and a whole lot of it. What else do you need? The layered & draped details are contemporary and creative, yet timeless. I had a hard time picking my favorite pillow designs. The Tuxedo for the classy babes, The Dip for the laid-back lady, and The Square Layers for the edgy foxes. Head to their website and check out the entire collection - it's something else! Side note: I spoke with one of the ladies of Stone Textile Studio on the phone last week. We chatted about my project and they seem like quite the lovely & down-to-Earth bunch over there. Keep it up! I love your work. Last night, I got to spend the evening atop Mount Tam with old & new friends. We watched the sunset above the fog and were each overwhelmed by the beauty of the sight. I couldn't get over the way the light from the burning sun interacted with the thick bed of fog. It was incredible - and pretty difficult to capture on camera. Though it's impossible to capture the beauty of creation with human hands, I was inspired to think of ways I can capture the essence of a sunset in interior spaces. Using my photos from last night as inspiration, I curated a small collection of products that mimic the color & texture of the sunset that we saw. Enjoy, and go catch a sunset of your own! I've got a ton of Bay Area spots that offer the perfect vantage to watch it, if you need a recommendation! It's time for a project share! I'm really stoked to reveal this one. I recently designed this bedroom for a friend in San Francisco - and I honestly wish it were mine. My friend is free-spirited, adventurous, and a little old-fashioned. She loves warm colors, rustic wood finishes, and vintage furniture. This was one of my favorite projects to complete in my free time. It was so much fun to work with a close friend, and help her achieve exactly what she was looking for in her San Francisco home! Enjoy! It's unreal that I'm back in San Francisco. Design Week passed far too quickly, and I wish that it could last a couple more weeks. These are some snaps from the second half of the week. My favorite secondary events were the Herman Miller and Alexander Girard exhibitions in the Meatpacking District. I could have gazed at the Girard panels and textiles for hours. I also enjoyed some quiet time exploring the Metropolitan Museum. I was thrilled to see a large Chuck Close piece in the Modern Art Wing. I also got to check out the Sketchbook Project Library in Brooklyn. My friend Greg showed me the sketchbook of one of his really talented friends, Greg Kletsel. I was completely lost in the pages, and I can't wait until the mobile library comes to San Francisco! Finally, I loved all of the copper products at ICFF. There were so many, and each was beautiful and unique. I'm thrilled that Bend has introduced this copper version of the Lucy chair. It's more fresh and modern than the typical powdercoat options. During my third day at ICFF, I was drawn to a few unique products. I love the approachable & fun colors used by O&G, Blue Dot, and Bend Goods. I am thrilled to see that Blu Dot and Bend have both released new colors in two of my favorite chairs! I also love the tribal graphics on Sauder's gorgeous coffee table and the wonderful craftsmanship represented in Workstead's lighting. I think today might be my favorite feature, yet! I thought I'd drop in and share a few quick iPhone snaps from the week. I've checked out so many beautifully designed spaces and enjoyed a lot of experiences that are quite unique to New York! On Thursday, I explored the retail scene in SoHo. The Carhartt store, on Crosby, completely stole the cake. I love the bright neon sign and minimal display fixtures. I also got to view the skyline, at sunset, from the top of the Standard Hotel in the Meatpacking District. It was breathtaking! I also really enjoyed exploring Brooklyn and the Flatiron District. I grabbed coffee with a friend at the Nomad Hotel Library Bar. It was nice to take a morning to sit quietly and relax. Lastly, check out my cute little hotel room! I'm staying at The Row, in Hell's Kitchen. I love the bright graphics and clean finish palette. Stay tuned for more updates from ICFF later today! I share a lot throughout the day on Instagram. You can follow me here! It's here! ICFF 2014 has officially begun. I can describe ICFF pretty easily in two words: "Inspiration Overload." I mean, it's unreal! There are hundreds of exhibitor booths (over 600!) - and each one as intriguing as the last. Because there is far too much to see in one day, I've decided to share bits and pieces over a Daily Take 5. Each day, I'll share some of the best things I saw. Today was easy! These products completely wow'ed me. I hope you're as inspired as I am, and be sure to check back for more. As I gear up and prepare for Design Week in New York City (NYCxDESIGN), I'm overwhelmed with excitement for all that's in store! I've got my brand new Madewell tote on my shoulder and my camera in-hand - I'm ready to soak everything up and share it with you. There are so many industry events, showroom visits, and opening receptions to consider and plan for - it's going to be a busy & exhilarating 4 days. Over the last couple of weeks, I've also had the best time perusing the ICFF & WantedDesign websites to admire the curated list of exhibitors. Several vendor profiles have really caught my attention, and I can't wait to see all of the new, innovative, and fresh products for 2014. If you aren't attending the shows, I encourage you to follow along with Grace-Made, DesignMilk, designboom, and other participating design blogs for real-time updates on this week's happenings. I'll kick things off with the Blogger's First Look @ WantedDesign on Friday afternoon, and continue to post throughout the weekend. Follow along on Instagram & Twitter! I thought I'd offer a sneak-peak at a project I've been working on. These prints (which are part of a greater collection) are inspired by young American women who embrace adventure. They love life, reach for the moon, and chart their own stars. I've always dreamt of pattern & textile design, so this project is an absolute treat. I can't wait to see where it goes! I created each piece using acrylic paint & gauche on heavyweight paper. Which is your favorite? I've been crazy about Heath Ceramics ever since moving to San Francisco two years ago. I love specifying their tile products on Interiors projects, and I love their innovations in ceramic accessories even more. I actually just bought last season's ombré bud vase for my mom's 50th birthday last week - and she loved it, of course! Their products are identifiable, always unique, and withstand the test of time. Heath officially launched their new Summer Seasonal Collection today -- and I am smitten! The collection was inspired by the Icelandic landscape, and it includes 3 matte colors reminiscent of the plant life and dark earth of the region. Personally, I'm wild about the lavender selection. It is so feminine and fresh! 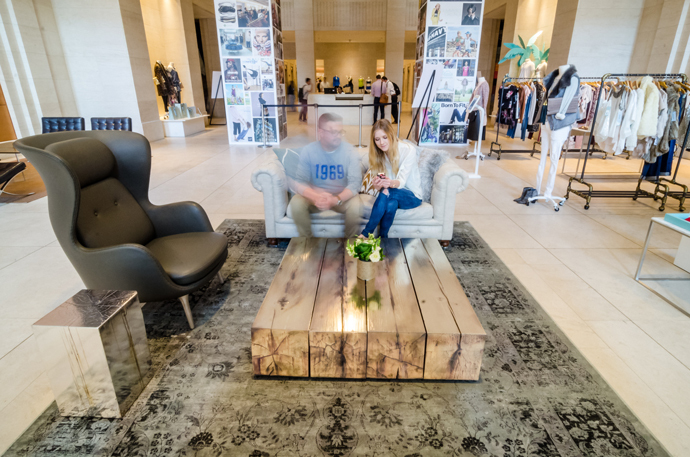 I can't wait to get over to the Heath showroom in the Mission to check these new products out! On rainy days, my attraction to bright, fresh flowers probably doubles. Today, my floral fix is the work of Lukasz Wierzbowski. His photography collection, entitled Neon Tambourine, is breathtaking. The consistent subject matter and aesthetic quality of his work is creative and mesmerizing. I picked my favorite photographs featuring ladies in nature. Go outside and be awesome this weekend.